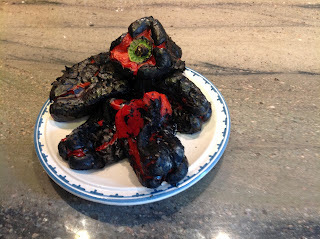 Fire roasted peppers are great to have on hand and can be a quick and easy solution to the problem of storage and shelf life, especially when one goes overboard at the Farmer's Market. 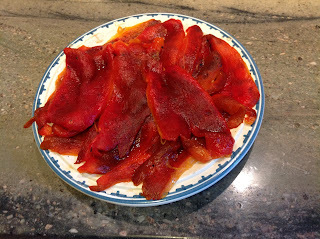 Char them on all sides on the stove top over an open flame; sweat them in a bowl covered tightly with plastic wrap until cooled. The skins will separate from the peppers and peel away easily. 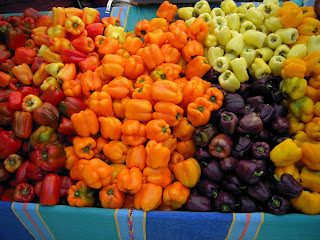 Roasted peppers are as versatile as tomatoes; use them in sandwiches, salsas, dipping sauces and main dishes. 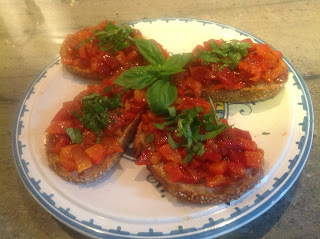 Here is a simple recipe for a wonderful bruschetta with goat cheese. Serves approximately 2 as an appetizer. Mix peppers with 2 tbs. oil, salt and pepper and set aside. Rub bread with garlic cloves and drizzle with olive oil, Grill or toast bread. Spread goat cheese on toasted bread, cover with red pepper mixture, garnish with fresh basil.